People always want more from their websites. The days of broadband and improved web browsers have enabled a move away from the static, basic sites and into a realm of elaborate and animated sites. There is a solution. As explained in the article Designer Web Design – Websites just got better, jQuery was introduced to provide cross-browser support, simplified development and a modular and standard approach. And it works. I’m loving jQuery and the advantages it offers more and more. 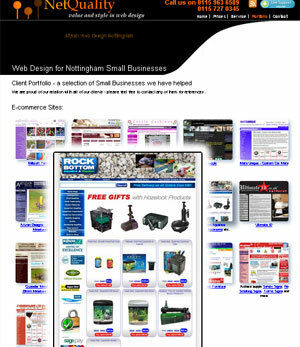 It makes my life as a Web Designer in Nottingham easier, as I have access to a wealth of articles, examples, and code snippets that offer exactly what people are looking for. Recently, we at Net Quality Web Design looked at our site and said it would be great if the portfolio page could showcase our past successes in a better light. It is always impressive to see lots of examples, but in order to fit them on one page the images have to be small. The ideal would be to have a larger image appear when the cursor is hovering over a particular example. A quick search on the Internet and Alen Grakalic’s article Easiest Tooltip and Image Preview Using jQuery was found. In his own words, he has come up with a solution for an Image Preview so simple that it hurts! I implemented his code, and like the majority of jQuery techniques, it plugs in and works seamlessly with the rest of almost any business website. In fact, it took longer to prepare the images which I wanted displayed then to incorporate Alen’s technique. There is now a fantastic amount of jQuery solutions available on the Internet and more and more are being developed each day. We at Net Quality Web Design have joined in this trend and offered some of our solutions back to the community. jQuery really offers a low cost/high return solution to improve websites and we are always available to see how our jQuery expertise can enhance your business website.